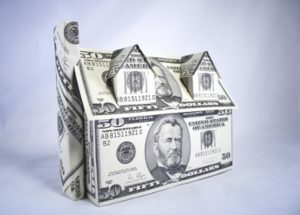 Another common real estate question: What is the difference between a “Deposit” and a “Down Payment”? As promised in past blog posts, I am writing another educational post on the topic of real estate. The feedback has been great so far, so I want to keep it going. If you are a regular reader, you know that I typically like to discuss development, local happenings, and all things related to Philadelphia + Suburban Philadelphia. Let’s mix it up again, shall we. Deposit. Down Payment. They sound almost the same, don’t they? Based on my own experience, it’s probably one of the most common questions I answer as a real estate professional; and rightfully so, as they sound like one and the same. The truth is, they are not the same. “Deposit” and “Down Payment” mean different things, serve different purposes, and cater to different people, when it comes to buying and selling real estate. Sometimes referred to as a “deposit,” sometimes referred to as “earnest money,” and sometimes referred to as an “earnest money deposit.” It really depends on who you are talking to, and what day of the week it is (the latter being a joke). Simply put, when the buyer gives an upfront deposit with an executed agreement of sale, it let’s the seller know that the buyer is committed to the transaction. Which means the buyer is now focused, one offer on one home; as opposed to many offers on many homes. The deposit can be a funny thing, as every Listing Agent/Broker has a different way of handling it. Some LAs like to see a large deposit when an agreement of sale is executed (anywhere from 5%-10%, based on the purchase price), but most LAs are more lax about it after an agreement of sale is executed (anywhere from 1%-3%, based on the purchase price). Needless to say, the deposit amount can vary from one transaction to the next. So as to break down the legalese, the buyer gives a deposit check to the Selling/Listing Agent, who then gives the deposit check to his/her Broker, who then deposits the deposit check into an Escrow Account, where it will then sit until either one of two things happens: 1. Everything goes as planned, both buyer and seller follow through with the agreed upon terms of the AOS (“consummation,” as noted above), and the deposit is given to the title company at closing/settlement to complete the transaction, or 2. The AOS is cancelled (“termination,” as noted above), for whatever reason as originally agreed upon (or as not originally agreed upon) by buyer and seller in the AOS, and the deposit is either returned to the buyer or forfeited to the seller (if forfeited to the seller, a portion of the deposit may even be shared with the Selling/Listing Broker, for work already put in to the “terminated” transaction). As you can now see, for such a simple term, it can get a little complicated. My apologies for the excessive wordiness. Now, although I mentioned that the deposit and down payment serve different purposes, they tend to get intertwined during the tail end of the buying process. As I also mentioned, if the transaction is consummated, the deposit is given to the title company at closing/settlement. Below is an example, using basic numbers, so you can see what I mean. Let’s say the agreed upon AOS purchase price is $100,000, and the Bank is requiring that the buyer contribute 5% into the transaction as a “down payment” (which would be equal to $5,000). Let’s also say that closing costs will run the buyer another 5% (e.g. mortgage fees, title fees, etc; also based on the purchase price, which is an additional $5,000). The buyer will then need to contribute a total of $10,000 to purchase the home, secure the loan/mortgage, and consummate the transaction ($5,000 for down payment, and $5,000 for closing costs). Let’s also say that the LA requires a 5% “deposit” upfront, in order to execute the AOS. Here are the numbers: 5% for Down Payment ($5,000), 5% in Closing Costs ($5,000), and 5% required for Deposit ($5,000, which was given upfront); giving us a grand total of $10,000 to consummate this transaction (Down Payment + Closing Costs), again, with $5,000 already given upfront (Deposit). When the LA withdraws the buyer’s $5,000 deposit from his/her Broker’s Escrow Account, and brings it to closing/settlement, the buyer now only needs to bring $5,000 to closing/settlement. The buyer then initials, signs, and dates about six reams worth of paper documents, and walks out of closing/settlement clicking his/her heels with their new keys in hand. It may seem simple when the subject is broached, but not everyone thinks like an accountant; and if you do not practice real estate for a living, it can be confusing. For those who are still having a bit of trouble grasping the above example, please know that you are not alone. I hope this blog post was educational, and my goal is to post more like it in the future. As most of you already know, I was born/raised in the suburbs (Yo, Abington) until the age of 18 when I ventured off to college at La Salle University (Go Explorers). It wasn’t until I lived on/off campus at La Salle for 4 years that I realized how much I truly enjoyed living in the city, and my passion and pride for Philadelphia has grown every year since. I’ve always been a big fan of history, architecture, and culture, and Philadelphia has copious amounts of all three, not to mention the food, the neighborhoods, the people, the events/festivals, and much more. Suffice to say, I moved to Philadelphia proper in 1997 and never looked back, which means I have now spent more than half of my life living in the city. 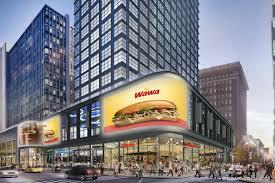 Fast forward to 2017, and Philadelphia is experiencing one of the biggest resurgences of urban life in the US. Our skyline is growing (Comcast Technology Center + FMC Tower, for starters), our population is rising (for the last 9 years straight, not to mention that we now have the 2nd largest downtown in the US), and our citizens are younger, educated, and more motivated than ever before (hello, millennial contingent). Just walk around Center City or University City any day/night of the week, and you’ll see what I’m talking about; the positive energy is contagious. So, what does the sharing economy have to do with what I just said? Well, everything actually. As Philadelphia is growing and changing, so are the ways we work, live, and travel. Office Space | How We Work: No, I’m not talking about the unbelievably-funny/accurately-portrayed movie by Mike Judge, I’m talking about Philadelphia’s commercial/office market and how it’s drastically changing … and fast. Take the office space that I work in for example, Pipeline Philly. It has all of the pros of a modern office space (enclosed offices, open work stations, floor-to-ceiling glass conference rooms, front desk/reception, etc), but in a more compact/yet-open atmosphere. I’m not sure of the exact amount of companies that work out of Pipeline today, but my guess is that’s it’s 50+. Yes, there are 2 floors of office space, approximately 20,000 sq ft, and 50+ different companies work there. That’s pretty amazing, especially knowing there are some floors in our building that only have 1 company. 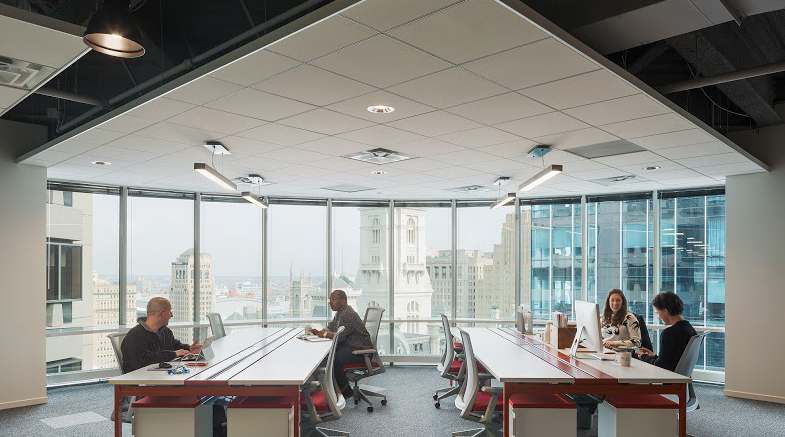 The collaborative work environment is alive and well in Philadelphia, as we are an emerging city for co-working spaces. Pipeline, WeWork, MakeOffices, Benjamin’s Desk, and Industrious round out some of the larger/more-popular spots, but there are many more smaller/niche spaces as well, such as Indy Hall, CultureWorks, CityCoHo, and Old City Collective. Shared office spaces and co-working are not only changing how our office buildings are designed, but it’s also reinventing the way we work. Residential Buildings | How We Live: This one may not be as much of a game changer, but it’s a direct reflection of Philadelphia’s changing office culture. Not only are today’s Philadelphians choosing downtown as their urban area of choice (Center City, University City, and surrounding neighborhoods), but their living preferences are driving the multifamily real estate market like never before. Out of all the residential-purposed cranes in Philadelphia’s sky today, only a few are constructing buildings that you can buy in (e.g. condominium buildings, such as One Riverside + 500 Walnut); which means all of the other residential-purposed cranes are constructing buildings that you can only rent in (i.e. apartment buildings, such as 1919 Market, Bridge, The Alexander (aka 1601 Vine), + The Ludlow at East Market). Reason being, today’s Philadelphian is not only waiting longer to buy his/her first home (ahem, millennials), but today’s Philadelphian is also downsizing from Suburban Philadelphia (ahem, empty-nesters). That is why apartments are a very hot commodity these days, as millennials and empty-nesters are Philadelphia’s largest population growth segments. Not only has Philadelphia’s apartment scene changed, but leasing flexibility is changing right alongside with it. AKA, Roost, + Airbnb also offer both residents and travelers living options like never before. Transportation | How We Travel: Philadelphia is known for having one of the best and most comprehensive bus/subway/commuter-rail systems in the US, but how Philadelphians prefer to get around is also changing fast. Services like Uber and Lyft have literally transformed Philadelphia’s transportation network overnight, while Philadelphia’s Indego bike-sharing service gives commuters another creative way to get around the US’ top city for bicycle commuting. I like to tell my clients, family, and friends that Philadelphia is a “manageable big city” (unlike our pals up in NYC), meaning that we are: compact, but not overcrowded; big, but not oversized; exciting, but not overwhelming. If you miss a train, hop in an Uber. If you miss a bus, grab a LyftLine or UberPool. Philadelphia now offers many different/convenient ways for people to get from A-to-B, at a reasonable cost, and in a short amount of time. Oh, and you can text and check email on your way! So as you can see, the sharing economy is changing the way Philadelphians live, work, play, eat, and shop. If you would like to learn more about how the sharing economy is changing our city, check out this article from Sandy Smith at Philadelphia Magazine.